help with getting higher eBay DSR scores. As a company anything we sell we include this fantastic comic strip, it tells the story of Detailed Seller Ratings to customers who may not be aware of the impact it can have on sellers, even when the buyers intentions are good. 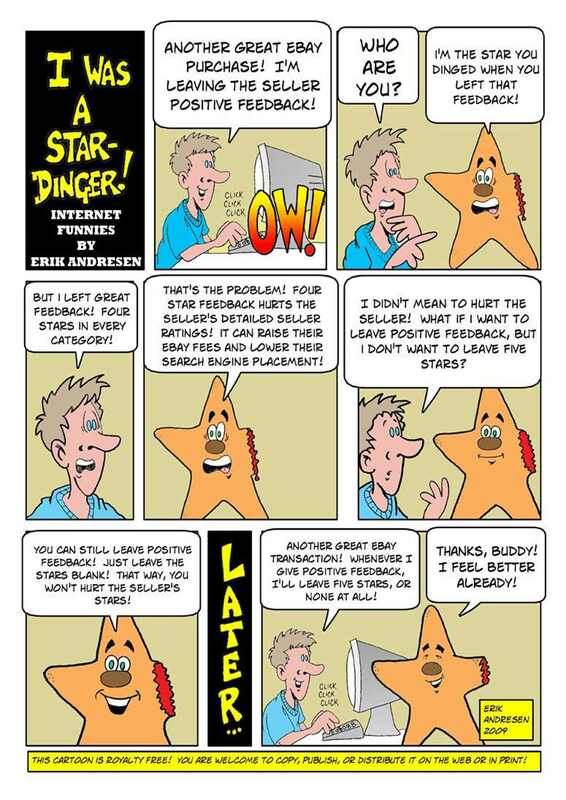 The cartoon shows how even when sellers leave three or four stars, and they think they are being nice, they are actually effecting you’re overall average, and if they are not going to give you five stars, then its really better if they don’t give you any at all. Many of the benefits from DSR’s come if sellers achieve 4.9 out of 5 on all DSR options, that’s a really high amount to achieve, and just a couple of buyers choosing to leave you low DSR’s can be the difference between you being a Top Rated Seller or not. This comic strip is free to download and use from this site, and since we began sending it with all our sales we have received improved detailed seller ratings, which have lead to a higher status on eBay. If you don’t think you are bothered about Detailed Seller Ratings, and feedback is all that you’re customers care about really, then tune into next weeks blog post when we will be looking at how Detailed Seller Ratings can lead to a change in you’re eBay status and the financial rewards which eBay give to you due to this. Okay, there are limitations. I eitedd about 500-600 items before File Exchange told me that I had exceeded daily limits. I went to eBay’s home page, clicked on LiveChat and spent about a half hour with a rep who was doing her best to be helpful but in the end could not help. My request was to extend my limits and from the conversation I feel that they were willing to do this for me, but they could not. I understand, it is a somewhat new application, so it’s not a shock that they couldn’t help me through the nuances. I have to wait 24 hours from the time of my last upload before continuing, so this puts a halt to my shipping rate updates, but at the same time I’m a lot further ahead than I expected to be by this time.Regarding editing the item descriptions from File Exchange, it appears to be possible from what I read in the eBay User Guide, however I cannot seem to come up with a description field to actually edit when I call up my file of active goods from eBay. I’m more concerned with finishing the shipping for now, but as the greater part of my listings quote old shipping rates within the descriptions I am going to have to revise them sooner than later to cut off any possible confusion.All in all, a good day though, got through a lot more than I had expected. My wife and I have been selling items on eBay for sveeral years now and after watching Diana’s video, there are a few things we can add to our selling tactics that could help generate more profit.